Suzuka. © Creative Commons / Will Pittenger. Easy. Around the fluent twists of Suzuka on Sunday, Red Bull’s Sebastian Vettel simply made it look easy. Felipe Massa took 2nd place to claim his first podium for Ferrari since the 2010 Korean Grand Prix, while Sauber’s Kamui Kobayashi took home a very popular 3rd place from his home Grand Prix. It wasn’t easy of course – not by a long shot. This late season charge – reminiscent of the lead-in to Vettel’s first championship – comes on the back of an upturn of performance at Red Bull, compared to Ferrari and McLaren, who have noticeably dropped back. Meanwhile Lotus’ push for podiums and prizes may have ceased for this year. Engaged at the front, Vettel’s drive was dipped in a charming subtlety. Improved qualifying certainly helped the reigning champion, not forgetting a perfect start, followed by a set of well-executed laps designed to garner reasonable gaps for his pair of pitstops. In this instance, all the bases were covered and everything came neatly together. When Vettel and Red Bull sing, the precision must be daunting. Occasionally toward the race conclusion, the double-world champion could have been accused of flaunting his rather obvious skill as he continued to press home ever faster, but that would be churlish. On this day, it is arguable few could have come close to touching Vettel and his Renault-powered RB8 machine – and this is something which must surely be playing on the minds of the folks at Ferrari and McLaren. This, of course, isn’t even taking into account the safety car period either. Launched almost as soon as the race started, the field was forced to close up before flying again (on lap 4), with Vettel – naturally – retaining the lead. From the restart onward, there was no challenge, no danger from other runners, nothing to stop the Vettel machine. “It’s been a fantastic weekend. Yesterday’s qualifying was perfect and today again; the balance of the car was amazing. We didn’t change too much at the stops; it just seemed to work fantastically well. I’m very happy, the guys have been pushing very hard and even though we didn’t have major upgrades here, it still seemed to come together and the balance was there – and that’s what made the difference today. The safety car was triggered by a series of clashes in turns one and two, most notably when Fernando Alonso (Ferrari) and Kimi Raikkonen (Lotus) came together as they escaped the grid. Vying for position amidst Sergio Perez’ Sauber and Jenson Button (McLaren), Raikkonen was squeezed onto the Japanese dirt, clipping Alonso’s left rear as he regained the road. The Finn lost a portion of his front wing, while Alonso spun off with a puncture, losing the engine as he slid to a halt. Now only four points ahead of Vettel in the Drivers’ Championship, Alonso knows both he and Ferrari need to bring their A-game to the final races. The often outspoken Webber was less than complimentary about the Frenchman’s tactics. “The guys confirmed that it was the first-lap nutcase again, Grosjean. The rest of us are trying to fight for some decent results each weekend but he is trying to get to the third corner as fast as he can at every race. Perez, meanwhile, ran wide in turn two as he avoided Webber/Grosjean, tightening the field up and forcing Williams’ Bruno Senna into the side of Nico Rosberg (Mercedes), with Rosberg retiring and Senna receiving front-end damage. The stewards saw fit to give Senna a drive through (unfairly in my opinion), while Grosjean deservedly garnered a ten-second stop/go penalty. Massa made the most of both carnage and a good start. Staring 10th, the Brazilian leapt into 4th after all the bumping and grinding, a spot he would hold until his first tyre stop on lap 17. The Ferrari man had spent the opening portion of the race chasing Kobayashi (2nd) and Button (3rd), finding an extra few laps from his new soft Pirelli’s, compared the used rubber latched to the Sauber and McLaren pair. Pitting on lap 13 (Button) and 14 (Kobayashi) cost the duo as they emerged behind the long-running Daniel Ricciardo (Toro Rosso). It was more than enough and as the first round of stops drew to a close, Massa returned to the circuit (on new hard Pirelli’s) ahead of Kobayashi, with Button now dropped to 4th. From there, Massa slowly extended his gap to Kobayashi, rarely feeling the pressure from the Japanese racer thereafter. With persistent questions over his drive for 2013, this podium could not have come at a better time for the likeable Brazilian. “It was a fantastic race! Being back on the podium after almost two years away is just great and I feel really uplifted. They have been two tough years for me and, sometimes, a million things go through your mind, some of them bad, but finally I can be happy! It’s an important result psychologically and also in terms of my future, at least I think so! Kobayashi brought home his Sauber home 3rd, much to the delight of the home fans, becoming the first Japanese driver on the podium at a home Grand Prix since Aguri Suzuki in 1990. For much of the race, Kobayashi held a gap of three to four seconds over Button, but strategy would dictate a final change to a new set of hard tyres on lap 31 for the Sauber racer – four tours before McLaren brought Button. Considering he started 8th, a top four was a decent effort for Button although it matters little in to him in the Drivers’ Championship stakes. Lewis Hamilton came home 5th following a couple of feisty duals with Perez and later Raikkonen. The former champion enjoyed an early tussle with the Mexican Perez, which saw the pair swapping places through laps five and six – finished neatly by the Sauber man with a dive down the inside of Hamilton at the hairpin. Hamilton retook Perez in the first set of stops – despite a brief stall by the McLaren man – however an agitated Perez attempted a repeat of his earlier hairpin pass, only to find the line covered by Hamilton, throwing the Sauber driver into an embarrassing spin and retirement. McLaren had better prepare themselves for that next year – while fundamentally quick and easy on his car, Perez’ habit of spinning off at key moments could rankle the English team. Hamilton’s mini-stall allowed Raikkonen to jump ahead. Despite missing a chunk of his front wing, the Finn maintained solid pace throughout, but there does appear to be a lingering feeling that Lotus have lost the edge on the top three teams. This certainly showed in the pitstops at least. After edging out a four-second gap to Hamilton early in his second stint, Raikkonen began to fall back toward Hamilton as the tyres aged, with less than two-seconds separating as the Lotus peeled off on lap 30. One lap was all Hamilton needed. A stellar in-lap, followed by an equally astonishing pitstop brought the McLaren out wheel-to-wheel with Raikkonen. 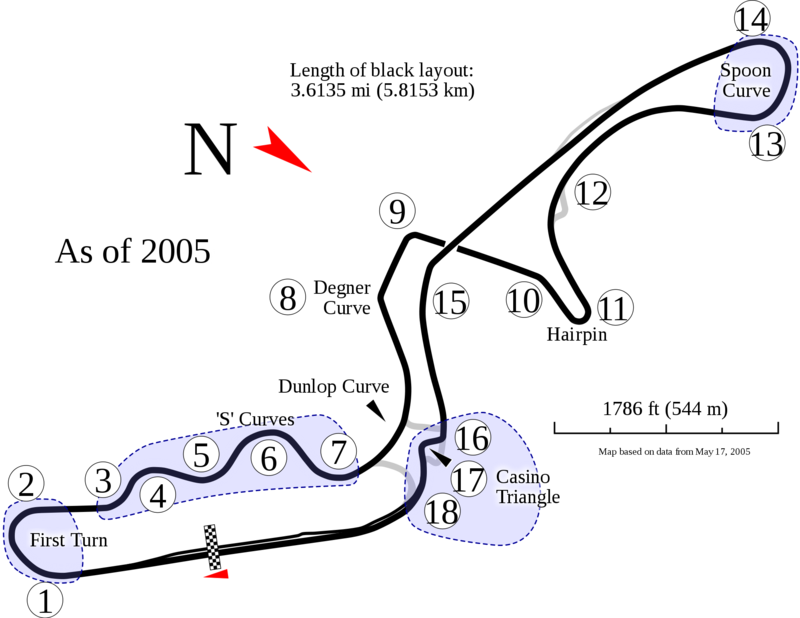 Despite having a slight speed advantage into turn one, the Finn lost the inside line – and the position – to Hamilton as the second turn folded out toward the “Esses”. Brilliant stuff. Raikkonen had to watch his back for the duration, as both Nico Hulkenberg (7th) and Pastor Maldonado (8th) followed him home. Both endured difficult qualifying sessions, leaving them 15th and 12th respectively; however their races were saved by a pair of very good starts. Webber overcame his first lap ramming to claim 9th at the flag. The Australian was left 20 seconds behind the pack at the restart, due to the quick safety car period, yet he Red Bull racer bided his time and carved his way through the field developed – a quiet, but excellent drive. Ricciardo held Michael Schumacher off for the final points place, thanks in part to an encouraging lengthy middle-stint on used soft Pirelli’s. The German pressed Ricciardo hard in the final laps, desperate to grab that final point from the plucky Australian. It’s arguable that Schumacher may well have done so and score more points had it not been for a moment of brain fade on the streets of Singapore, which resulted in a 10-place grid drop. Once again Heikki Kovalainen won the battle of the minnows, bringing his Caterham back 15th ahead of Timo Glock (16th), Vitaly Petrov (17th) and Pedro de la Rosa (18th). The early-portion of the race saw an impressive run by Kovalainen, holding 11th spot for a time ahead of Vergne; however as expected the Renault-powered machine faded as the race progressed. Neither Charles Pic nor Narain Karthikeyan made it to the end, with both retiring on laps 39 and 34 respectively. So now what? With the Korean Grand Prix this weekend, the momentum has swung toward to Vettel and Red Bull. Alonso’s retirements at Spa and Suzuka may have irreparably hurt his title chances, while the Red Bull machine carries of regardless – and that’s a shame. Vettel will now win this world championship, but he will do so having not being the best driver in the field.